Subscription boxes have become the HOT new trend, with almost every brand jumping on the box bandwagon—heck, you’ve probably even had one delivered to your door in the last 6 months. From mini styles filled with anything from samples to full-size items to trunk sized styles stocking designer shoes and fashion, the industry has just about covered everything with some absolute gems waiting to find their way to your doorstep. But really, which box is right for you? That’s why I’ve launched Sporteclub! It’s an exclusive, one-of-a-kind club where you get access to a bunch of cool sh*t that no one else does. Feeling special yet? Good, because you are! 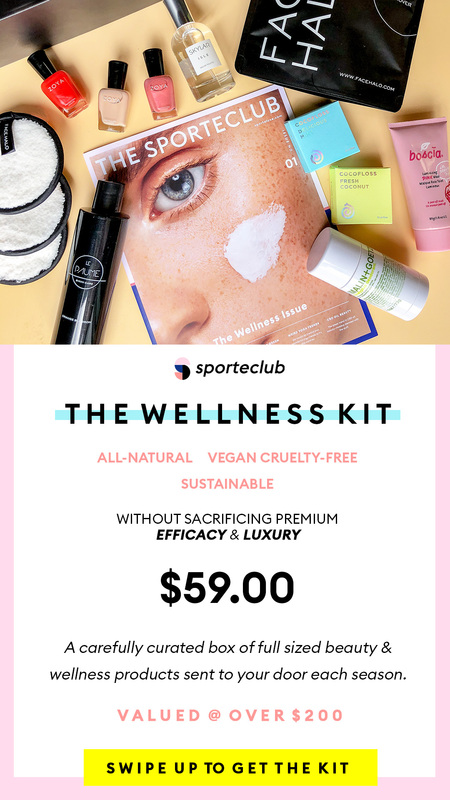 In being a Sporteclub member, you’ll gain access to benefits from our premium partners and have our seasonal wellness subscription box, The Kit + magazine, delivered straight to your door each season. Because let’s be honest, life is always more exciting when you have a delivery on its way! Think of this like the raw vegan icing on your cacao cupcake. It’s curated by ME and is filled with all my fave finds that I personally recommend to my friends and family. In July’s wellness issue, I’m shining a light on brands that not only look good but do good — so you’ll find plenty of vegan, cruelty-free, preservative free and eco-friendly goodies in my kit, and I hope you love it just as much as I do! Buy my Wellness Subscription Box for only $59 HERE! A peek at what could be in the kit! Personalized to support each season, the Sporteluxe Summer Wellness Kit is specially curated by me, to help you live well and thrive all summer long. Valued at over $200 worth of luxury wellness products for only $59, these are the faves that I recommend to my friends and fam on the reg! Throughout the kit you’ll find only well-intentioned brands that align with Sporteluxe’s own wellness philosophy – whether it’s all-natural, vegan + cruelty-free, sustainable, and more – without sacrificing premium efficacy and luxury. Shine on, Sporteclub!